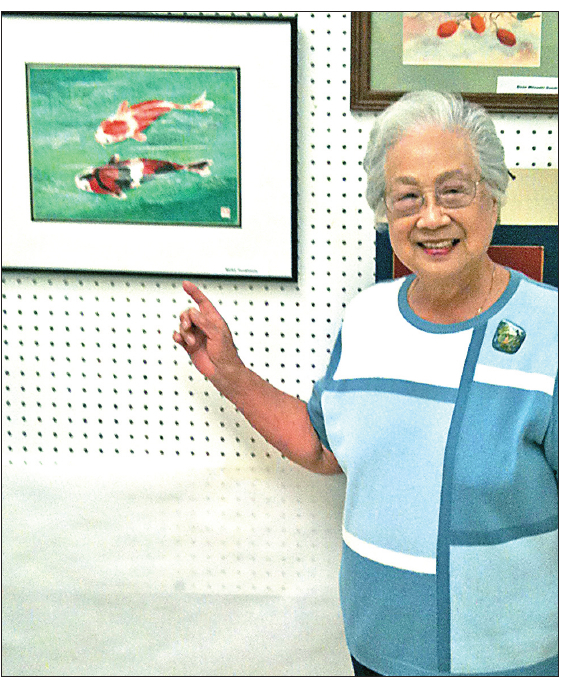 VISALIA — A collection of work by chigiri-e artist Reiko Yoshimoto is now on exhibit at Arts Visalia’s Visual Art Center in the Central California town. “Painting with Paper,” featuring some 30 pieces by the 85-year-old Monterey Park resident, runs at the gallery through May 30. Born in Hiroshima, Yoshimoto is also known for her published poetry. The title of the exhibition stems from the method of art that is employed in the majority of the works on display. Chigiri-e is a collage process where the image is composed of pieces of colored paper as opposed to paint. It is a traditional Japanese art form dating from the Heian period, 794 AD to 1185 AD, a very rich age for poetry, literature and art. The word “chigiru” means to tear and “e” is an image, therefore an image produced by tearing pieces of specially made and dyed paper, washi. Yoshimoto started taking classes in chigiri-e in 1993 and she continues to attend classes while perfecting the technique. 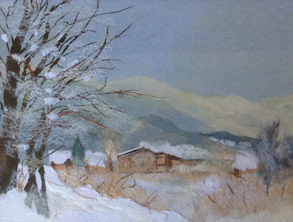 Much of her work reproduces the classic art of many artists, but in the medium of torn paper. The artist, using her hands, tears, wets, twists, stretches, separates fibers and applies the worked paper on to another surface, traditionally paper scrolls or other paper media. Many works of chigiri-e, including those in this exhibition, appear from a distance to be watercolors, but upon close examination, the paper qualities become apparent. At a distance, Reiko Yoshimoto’s chigiri-e look like paintings. Flowers or plant images are typical and traditional subjects, and many such works are included in this show. Also showcased in this exhibition are works in the bunka shishu method of Japanese embroidered art, a method that dates back to the early 20th century. Included in the bunka works by Yoshimoto in the exhibition are a wonderful group of reproductions of woodblock print images by the renowned woodblock artist Ando Hiroshige. Yoshimoto was born in 1928 and attended schools in Japan through high school. At a very early age, she was recognized for her artistic ability. In 1945, while in high school, she experienced and survived the atomic bombing of Hiroshima. After World War II ended, she met Tadato Jim Yoshimoto, a U.S. Army sergeant from Los Angeles stationed in Japan serving on Gen. Douglas MacArthur’s staff. In 1950 they were married and moved to the United States upon Jim’s discharge. They had two children, Bill and Grace, and her son is known in Tulare County as the former assistant district attorney and as a pastor at a local church. Her daughter told The Rafu that she is beginning a project to try to record as much of her mother’s history as possible, and also later those of other Issei and Nisei, to preserve the rich stories they have to tell. Arts Visalia is located at 214 E. Oak Ave. in Visalia. Call (559) 739-0905 or visit www.artsvisalia.org/ for more information. and what is the tuition? Reiko does not give lessons. She is, however, part of a chigiri-e class led by Mrs. Tsuruko Iwohara that meets at the Nishihonganji Buddhist Temple in Little Tokyo, LA. The tuition is probably about $30 per month but please speak to the instructor for the current tuition.